Fall into great taste with the Certified Angus Beef® brand from Caraluzzi’s Markets. 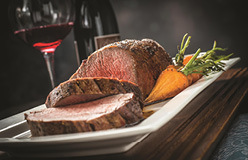 Gather your friends and family to enjoy juicy, flavorful and perfectly cooked roast beef. Check out the resources below to help you select and prepare the perfect roast! A beef roast will take center stage on your dinner table, whether you’re serving family or a gathering of friends and colleagues. To ensure it’s just right, begin with high heat, then cook it low and slow. Preheat the oven to 450°. Cook the roast at this high heat for 15 minutes. Reduce heat to 325°F for the remainder of your cooking time. Then use an instant-read thermometer to cook roast according to recipe instructions or to your desired doneness. There are many different ways to prepare beef, but when it comes to comfort foods, there’s nothing better than braising. Preheat heavy-bottomed pot over medium-high heat on stovetop. Season roast generously with kosher salt and cracked black pepper. Add a small amount of oil to pot, then add roast and sear on at least two sides. Remove roast and add cut vegetables(typically onions, carrots and/or celery); stir and cook until brown. If desired, stir in 2-3 tablespoons tomato paste, then add 1-2 cups liquid (wine, stock or water) and stir browned bits from pan bottom. Return roast to pan, or transfer roast and pan contents to slow cooker. Pour in additional liquid to cover bottom ⅓ to ½ of roast and add fresh herbs if desired. Cook approximately 6-8 hours depending on size of roast – it is done when fork-tender and pulls apart easily. * These instructions are a general guide. If your recipe has specific instructions, follow them.